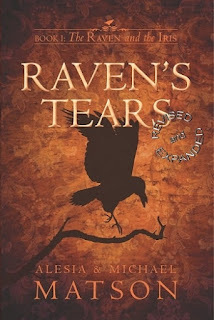 Today we are interviewing Alesia Matson, co-author (with Michael Matson) of the urban fantasy novel "Raven's Tears." 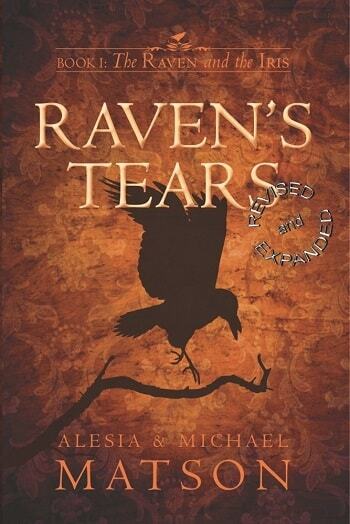 "Raven's Tears" is on sale during August 2015! Get your copy here. Michael and I are currently living in far northern California. He retired for the third time in 2013, and I for the second time, and rather than growing old and bored and bad-tempered and maybe stabbing each other before we hit our 60s, we thought we might try writing, instead. So far, it’s worked out fairly well. Describe the plot of “Raven’s Tears” in a few sentences. Two people who’ve been lying for most of their lives fall for each other. Somewhere amid the deceptions and betrayals, they have to find what’s true about themselves, and each other, before her past catches up with them both. Set amid all the fantasy trappings of the world of Menelon, the book’s protagonists must ask - and answer - the question: What wouldn’t you do for love? Anyone who likes strong, smart characters falling for each other in a metropolitan setting. If you like crime dramas and police procedural elements in your stories, you’ll find something to like in Raven’s Tears, and especially anyone who’s ever wanted to read those stories in a fantasy setting - magic, swords, elves, dragons - is going to find a lot to love. What inspired you to write a book with elements of both fantasy and romance? Michael and I are role playing gamers from way back, and we’ve always most enjoyed books that had all the elements of the kinds of games we liked to play. We’ve also always written - most of our courtship was conducted via the written word, actually - so fantasy role playing and romance blurred into fantasy romance when we put together the plot for this series. It’s much more difficult to market, but the feedback has been so positive that we know we must be on to something. Angelique Blakesly, the eponymous “Iris” of the story. She’s a woman who had a crappy hand dealt to her early in life - horrid, really - and has had to make some pretty crappy choices in order to deal with it. On top of it all, she’s dealing with the onset of some symptoms of a mental illness while concealing her secret identity as a high-stakes burglar AND falling in love with a man who’s just as twisted up as she is, in his own way. It’s been a high-bar challenge for a first book/series, but I’m enjoying it a whole lot. What was it like to write on a husband-and-wife team? =heh= About what you’d expect, really. Adding to the fun is the fact that Michael and I are polar opposites in almost every way except in being deeply committed to our art. So, we disagree a lot, and we fight about the story and what’s best for it, but always because we’re both so passionate about it. Then we resolve our differences, kiss, and make up - and yes, the whole world looks brighter in the aftermath of one of those fights. In the end, I do believe that the catalytic nature of our relationship makes it into our books. We’d like to think that this energy drives our stories - and so far, our readers seem to concur. Many. My husband’s more a prosaic Tom Clancy guy, while I’m reading Salman Rushdie, Patrick Rothfuss, and Neil Gaiman. Robert Heinlein was a seminal influence in my writing style, and Molly Ivins, though she considered herself a journalist, taught me so much about how write with humor - and that iconic southern grace which I’ve yet to master. We’re all for them. Ebook readers provide access to stories for people who otherwise wouldn’t get it - like the homeless, or the disabled - as well as giving readers access to large - I’m talking VAST, here - libraries of books of all genres and perspectives. In my opinion, anything that increases the overall readership of books is going to be good for the book industry. Whether or not it’s good for the art of storytelling remains to be seen. I don’t like editing for grammar and punctuation. I adore brainstorming the plot, creating the characters, setting up the backdrop. I’m all right with the rewriting phase of editing, where I’m revising drafts, adding material, taking it out - that’s a bit of fun really, like sculpting the story from raw clay - but the nit-picky stuff I only love when I pay a proofreader to do it. Tell us a bit about the “Raven’s Tears” promotion in August. We’re giving readers one last chance to buy into “The Raven & The Iris” trilogy - and the world of Menelon as a setting - at a deeply discounted price. For the month of August, the price of the ebook only drops to $1.99. Then, in November, the second book in the series will be published, and we’ll run a 3 day give-away for it on Amazon and on MetaphorPublications.com as part of the launch party. The next book in the series, “Dead Man’s Trigger,” comes out in November. Without giving too much away, what can you tell readers about it? When the narrative resumes, a bit of time has passed, while nothing much on the outside has appeared to change. However, there’s so much going on just beneath the surface, and we take the reader deep into the seamier side of Fernwall - and the two protagonists - as the consequences of their choices mount. In “Raven’s Tears,” the reader met Angelique Blakesly; in the sequel, Raven and the reader get an extended introduction to Iris. I can’t tell you much more than that without “going spoiler,” but I can promise you that with the continuation of the story, we push these two to the breaking point in order to make them face the truth about each other, and about themselves. This ebook has a secret mission: It also serves as an introduction to the fantasy world of Menelon. You’ll find clues to that mission throughout the whole ebook - they’re active links that, if tapped or clicked, take you to an entry in our wiki that will give you more information on the subject! So, you can learn more about the Clocktower than we could spare words to include in the books, and about Guardian Paladins, Fernwall, and much more. Some of the secondary characters in the books have entries too, and we’re constantly adding new material to that database for our readers’ enjoyment. What’s more, we’re opening up the world as a setting to other writers, and possibly to role playing gamers as a setting for fantasy games. The wiki can also be accessed through Metaphor Publications’ website -- https://MetaphorPublications.com -- but you’ll need to create an account to access it from there. If you’ve got aspirations to write fantasy but haven’t had the time and energy to build your own setting, you might give ours a look. There are other ebooks that are set in Menelon available on our website, including a free short story, and lots of ways to get in touch with us here if you like what you see! “Bishop-Florian security is tight for this exhibit,” Louis had told her, stretching out the floor plans for the venerable old building over his desk. “They’ll have attack dogs, of course, and extra guards besides. That’s nothing new,” he’d smiled; a mirthless expression, but Angel had already become engrossed in the drawings in front of her. She had always been a quick study. It had been one of the qualities that had originally endeared her to him. The woman who greater Fernwall knew as Lady Angelique Blakesly, in fact, possessed a suite of talents that had once made her a desirable apprentice in the slippery, chaotic world of post-war Püran-Khir: keen intelligence, fast reflexes, good instincts, decent strength, and cold-blooded fearlessness when faced with a challenge. Happily, these were also traits that made her an even more valuable “associate,” lacking a better term for it, in the confines of peaceful, civilized Fernwall. Louis had watched her avidly, almost greedily, as she pored over the drawings, delighted with what he saw. Angel’s mind was taking in the information before her at a phenomenal rate, memorizing and collating data with an ease that surprised anyone who might have mistaken such loveliness for shallowness. This job was much more challenging than any she had previously attempted. Still, he had few doubts she’d succeed. Any woman who could successfully deceive the entire noble class of Fernwall and keep that web of lies intact for years could certainly figure out how to infiltrate a museum and take whatever she wished. In this case it was a mere bauble, a necklace crafted by dwarven smiths so far back in history, humans had no clear record of it. The necklace, ‘Mâgun-Zak,’ had been a gift to the royal family of Vin-Nôrë from their dwarven neighbors, and was quite literally priceless. The metal wasn’t silver, but niobïtan. The centerpiece was molded and etched to resemble a raven’s head and wings, bejeweled and shining iridescently. Each stone, tear-drop cuts scintillating like the source of light itself, were “flawless” by human standards. When one looked closely, one saw that each delicate link in the interlocking chains had been etched with countless dwarven rune-letters, reputedly a prayer to Eldar their ancient God, to bless the wearer with health, protection, good fortune and long life. “Angelique Blakesly” was a fiction, of course. A cover, suitable for hiding her true purpose in the city: gathering information, from the inside, for the high-stakes thefts he selected, and directed. A quite lovely fiction, he mused, watching her complete her first study of the floor plans. Louis understood young Vincent Sultaire’s fancy for her. He didn’t quite understand what she saw in Sultaire; but then again, a woman’s mind was always a mystery. He’d resigned himself to that, too. I wanted to stop by and thank you again for the interview!